On Monday, we cooked two new dishes from one of my favorite food blogs, SkinnyTaste, and they were a success. My honey cooked the grilled Asian chicken and I made the edamame fried rice. 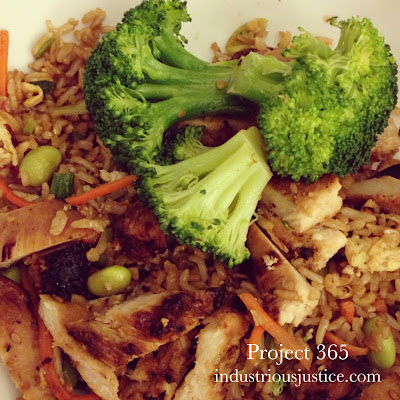 We threw in some steamed broccoli and we had delicious and healthy rice bowls. I had done a little prep work the day before, including marinating the chicken and cooking the brown rice. So far, all of the recipes we have cooked from SkinnyTaste have been keepers!